Vinod Joshi, the secretary of the trust that manages a small temple and ashram nestled in a picture-postcard valley called Kainchi near Nainital, got a call from Larry Brilliant, an American physician and former director of Google's philanthropic arm Google.org. "Larry said some Mark would be coming to the ashram for a day," recalls the short, bubbly man with twinkling eyes, who has spent his life in the service of his spiritual guru Neeb Karori Baba at the ashram. Joshi doesn't remember exactly when because he had no idea who Mark Zuckerberg was. Facebook was yet to become a daily habit of about a billion and half people. But he does remember that Zuckerberg flew down to Pantnagar, about 65 km from Nainital, and then drove to the ashram of Neeb Karori (often called Neem Karoli) Baba, who died in 1973 but continues to enchant several highprofile Americans. The Baba's halo shined bright last week when Zuckerberg mentioned to Narendra Modi during the Indian prime minister's US tour that he had visited a temple in India during the early days of Facebook on the advice of Apple founder Steve Jobs. "...he (Jobs) told me that in order to reconnect with what I believed as the mission of the company I should visit this temple that he had gone to in India early on in his evolution of thinking about what he wanted Apple and his vision of the future to be," Zuckerberg told Modi at a town hall meeting at Facebook headquarters. "So I went and I travelled for almost a month, and seeing people, seeing how people connected, and having the opportunity to feel how much better the world could be if everyone has a strong ability to connect reinforced for me the importance of what we were doing and that is something I've always remembered over the last 10 years as we've built Facebook." Joshi says Zuckerberg landed up with just a book in his hand without even a change of clothes. "He was wearing a trouser which was torn at one knee," he told ET. Zuckerberg was supposed to spend only one day, but stayed for two because Pantnagar was hit by a storm and flights could not take off. The ashram, located beside a bubbling brook and surrounded by tall pine-forested mountains, itself is small for a saint who has an elite following that includes Hollywood star Julia Roberts. 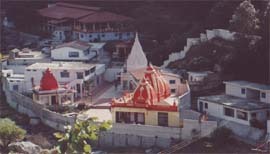 It has five shrines, including one for his favourite Hanuman. Many of the Baba's devotees believe he himself was the monkey God incarnate. Opposite the shrines is a white building with square columns where the sage used to live. "We call it the White House," Joshi says. Even in the shrine where the Baba lives on in a life-size marble statue, he wears a Burberry-check blanket. As the evening aarti (lamp service) winds down at the shrine, I tell Rameshwar Dass standing at the back of a small crowd of worshippers that the statue is life-like. "Well, almost," Dass replies with a mischievous smile, his eyes crinkling up crows' feet on the edges. "He looked quite different." Dass, a former New Yorkbased photographer, was Jim until the sage gave him his new name. When Jim first met Neeb Karori Baba in 1970, he stayed by his side for two years. "The atmosphere around him was very powerful. It was like a spiritual pressure cooker," Dass says. I ask him what is it that attracts foreigners to the sage. Dass thinks for a moment and then says, "He talked to us a lot about Christ. He used to say that Christ and Hanuman are the same. That Christ never died." He says when the Baba talked about Christ it was as if he was seeing him. "Tears used to flow from his eyes." Dass says the Baba never gave sermons or scriptural lessons except urging them to be of service to others. "The idea of service appeals to Christians like us." He remembers Ram Dass, one of the Baba's earliest disciples, joking with him about a giant statue of Hanuman at another ashram of the Baba in Nainital. "Ram Dass said, 'What would my friends in the US say if they saw me worshipping a giant concrete monkey'," Dass says with a hearty laugh. It was Ram Dass or Richard Alpert who made Neeb Karori Baba famous among elite Americans. Alpert, an American psychologist, met the Baba with fellow psychologist and psychedelics researcher Timothy Leary while on vacation from Harvard. He spent many years with the sage and wrote an unusually designed book 'Be Here Now' on him and Hindu philosophy. The book, written like a graphic novel, influenced many readers in the US who began to associate with a commune and foundation Alpert had established in New Mexico. "I met Steve when we were all young and the world was full of promise and so, of course, we went to India as spiritual seekers," he writes in the email. "Girija [Brilliant's wife] gave him our only blanket from Maharajji when Steve was very ill." Though Neeb Karori Baba is no more, he evidently continues to be a comforter to many.